The comprehensive rheumatoid panel measures various a wide range of markers related to autoimmune conditions. What is in the comprehensive rheumatoid panel? The comprehensive rheumatoid panel measures the CCP IgG antibodies, rheumatoid factor IgA, IgG and IgM antibodies, and Sjogren's SS-A and SS-B antibodies in the blood. Why is the comprehensive rheumatoid panel important? The comprehensive rheumatoid panel provides a detailed assessment of a wide range of markers associated with rheumatoid arthritis. This Comprehensive Rheumatoid Panel is a blood test. The comprehensive rheumatoid panel checks a variety of markers related to rheumatoid arthritis. The comprehensive rheumatoid panel builds on the rheumatoid arthritis panel. The comprehensive rheumatoid arthritis panel tests the CCP blood test, rheumatoid factor IgA, IgG and IgM antibody levels, and Sjogren's test panel. Together, this combination of blood tests helps screen for rheumatoid arthritis as well as SLE and Sjogren's syndrome. To get a comprehensive rheumatoid panel near you, simply order online and get tested at the lab you selected. 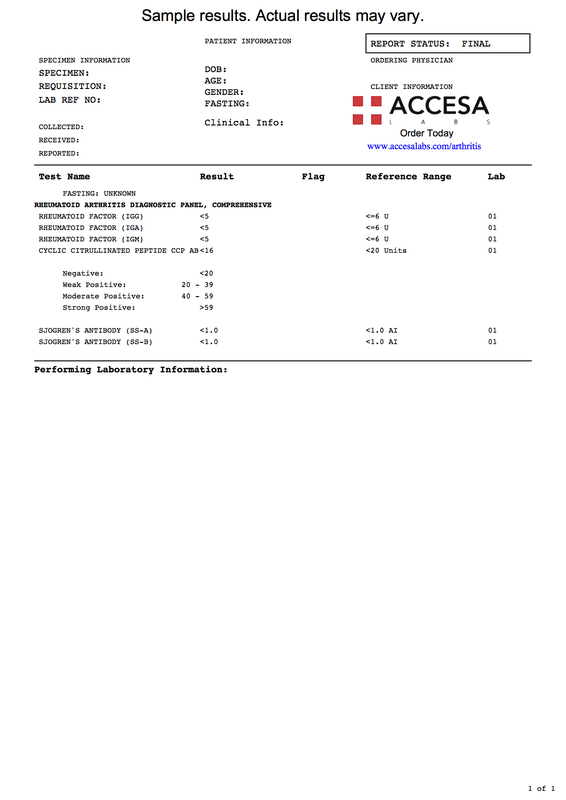 Once your comprehensive rheumatoid panel lab results are ready, they will be available for download. For a less detailed arthritis marker screening, check out the arthritis test panel. Comprehensive Rheumatoid Panel at Guaranteed Prices.